Please don’t miss an amazing event that will play tonight on all three major networks, Stand Up To Cancer. Please join me by tuning in this Friday, September 5, at 8 p.m. (EST) to catch Stand Up To Cancer on ABC, CBS and NBC. This first of its kind one-hour telecast will feature celebrities from film, television, sports, journalism and music coming together to raise money for cancer research. Lance Armstrong Foundation supports this effort to raise awareness and funds for the cancer fight and Lance Armstrong will participate in the telecast. Inspired to act by their own personal experiences with cancer, the Stand Up To Cancer team recognizes that we can no longer rely on the current system alone to give us the breakthroughs we need. They are calling on the public to help take matters into our own hands, investing in a revolution that will change the way scientists and clinicians work to understand and treat cancer. 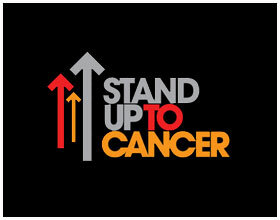 Stand Up To Cancer is more than a rallying cry. It is a galvanizing force created to urgently move cancer research forward. The money raised during this event will go toward building “Dream Teams” made up of scientists, clinicians, technicians and other experts who will focus on a specific cancer problem. Funds will be administered by the American Association for Cancer Research, the largest scientific organization in the world focusing on high-quality, innovative cancer research. I am inspired by what Laura Ziskin, movie producer and cancer survivor, has put together with her team at Stand Up To Cancer and I know this will make a huge impact. For more information on Stand Up To Cancer please visit Stand Up To Cancer, The AACR (American Association for Cancer Research), or coverage on the Lance Armstrong Foundation site. I have it scheduled to record. Thanks for the reminder.